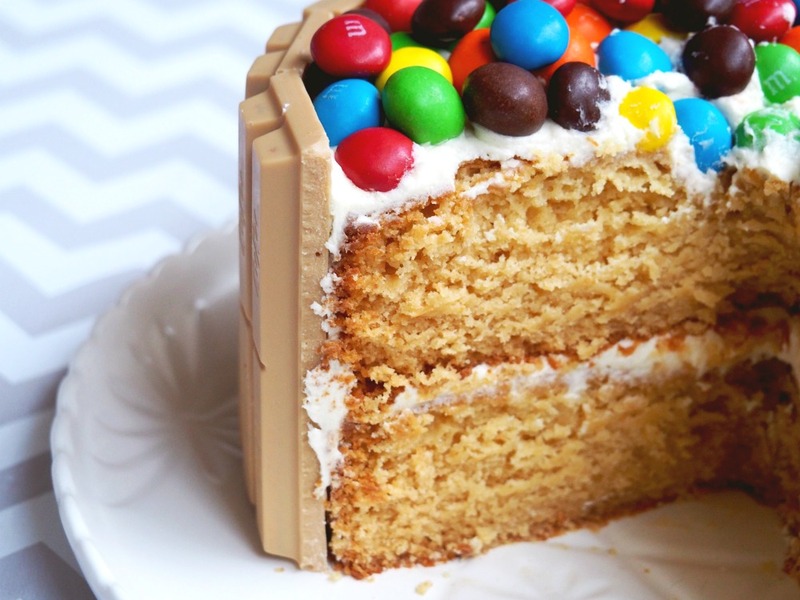 This Ultimate Caramel Kit Kat Cake is totally extra; moist caramel mud cake, sandwiched with buttercream and decorated with Kit Kats and M&Ms. Best of all it, tastes as sensational as it looks! It’s a shiny new year, so here’s a shiny new recipe! This cake is so good, I’m pressing publish on it first and am definitely not saving it until last! So here’s the funny thing, I have two godsons and they’re both called Jack! I differentiate them by age/size, Big Jack (15) and Little Jack (4). They may be different ages and live in different hemispheres but of course, I love them both the same. Big Jack was born before my cake making obsession really set in but Little Jack was born right amongst it. I’ve made every birthday cake for every birthday of his life. Cake highlights include the cake that almost got us divorced, the AWW Train Cake, and the rather impressive Lion Guard Cake. Poor Big Jack has missed out in my birthday cake making department. You can’t very well send a cake across the sea to the motherland. But when I was back in the UK in October, I got to celebrate Big Jack’s birthday with him in person which was such a treat. He’s such a wonderful young man; kind, thoughtful and smart too. 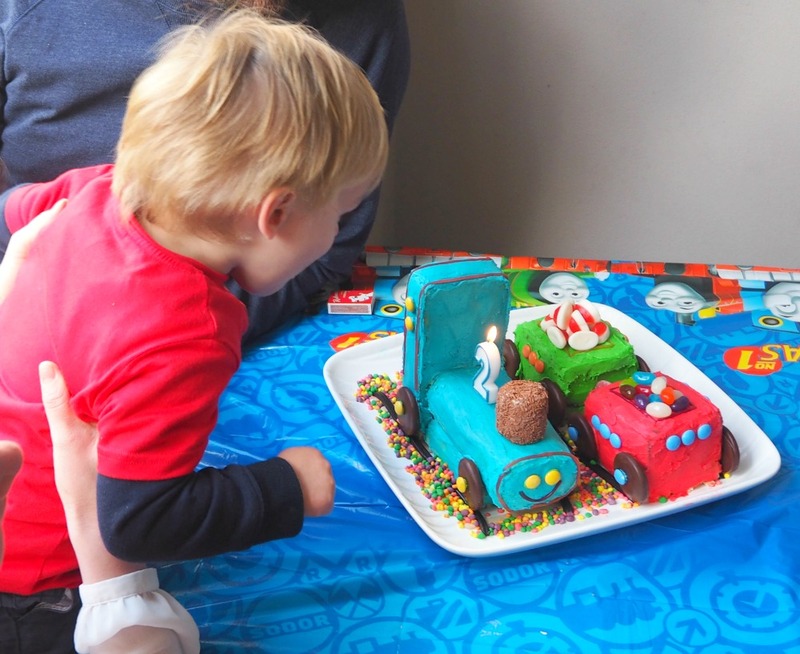 This is the first birthday I’ve celebrated with him since he was in nappies so of course I had to make him a cake and as he was the birthday boy, his wish was my command! 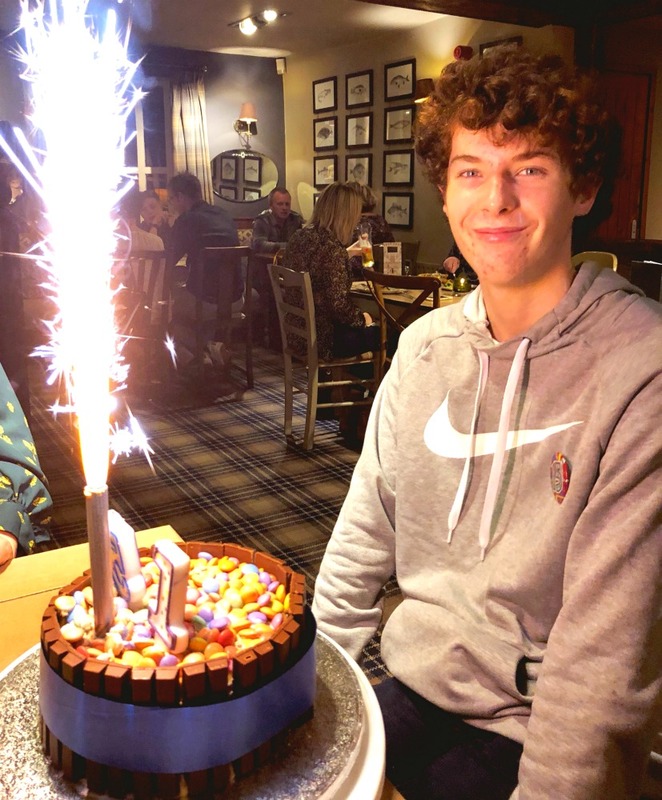 He asked for a caramel cake with smarties and whatever the birthday boy wants, the birthday boy gets. The cake exceeded everyone’s expectations, even mine and Jack declared it the best cake he’s ever eaten. High praise indeed! The cake was such a hit that I made it again when I got home for my OTTs (Official Taste Testers)- my neighbour Luce and site manager Wayne – to celebrate both their birthdays. They nearly had a cake-gasm, it was that good! I took the left overs in to work and my colleagues said it was the best cake I’d ever made which is a big call knowing how much cake I’ve contributed to the staff kitchen over the years. One colleague loved it so much, he asked me if I’d make his wedding cake. Eeep! In case you’re wondering I had to politely decline, my nerves just wouldn’t take it! So yeah, this cake is pretty special! It’s super easy to make too. Whatever you do don’t miss out the top ‘n’ fill, whether you buy shop bought or make your own in the Thermomix it really takes the cake to the next level. The secret to a good mud cake is to cook it long and at a low temperature, so I like to divide the mixture between two sandwich tins, reducing cooking time significantly and resulting in a deliciously dense bake. I found caramel Kit Kats down under but I used regular Kit Kats in the UK and they worked just as well. I must say as much as I love Smarties, it’s much better to top the cake with M&Ms because the colours are so vibrant and they really make the cake pop. 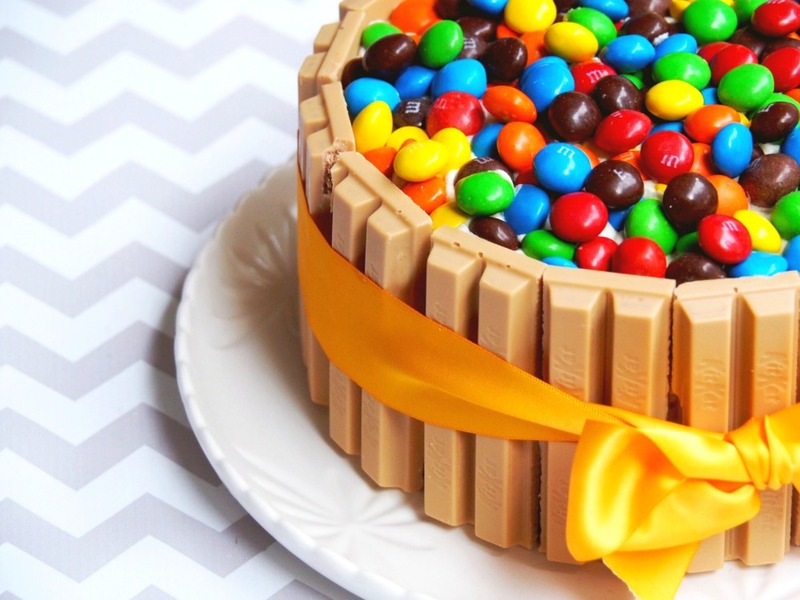 If you want to go all out, why not top things off with some Caramel M&Ms? I use buttercream to sandwich the cakes together and to decorate the cake but it’s also great served with just a drizzle of ganache or caramel sauce and of course is also delicious naked. This Caramel Mud Cake is an absolute doddle to make but whatever you do, don’t overcook it. You want to err on the side of caution and for the cake tester to be nearly clean, not really clean! This is definitely my go-to special occasion cake now. What’s yours? Have you got any friends or family with the same name? Grease and line 2 shallow 7 inch cake pans. Preheat oven to 140C. Place butter, chocolate, sugar, golden syrup, vanilla essence and water in a heavy based saucepan. Stir over a medium low heat with a wooden spoon until chocolate has melted and mixture is smooth. Set aside to cool for at least 10 minutes. In a large bowl, combine the chocolate mixture with the top ‘n’ fill and sour cream and mix gently. Add flours and stir with a wooden spoon until well combined. Place batter into prepared tins and cook for 40-45 minutes or until a cake tester inserted into the centre comes out almost clean. Continue to check in 10 minute intervals until cake is cooked through. Be careful not to overbake the cake – the skewer should not come out perfectly clean because you want the mud cake to be a little bit soft and sticky. 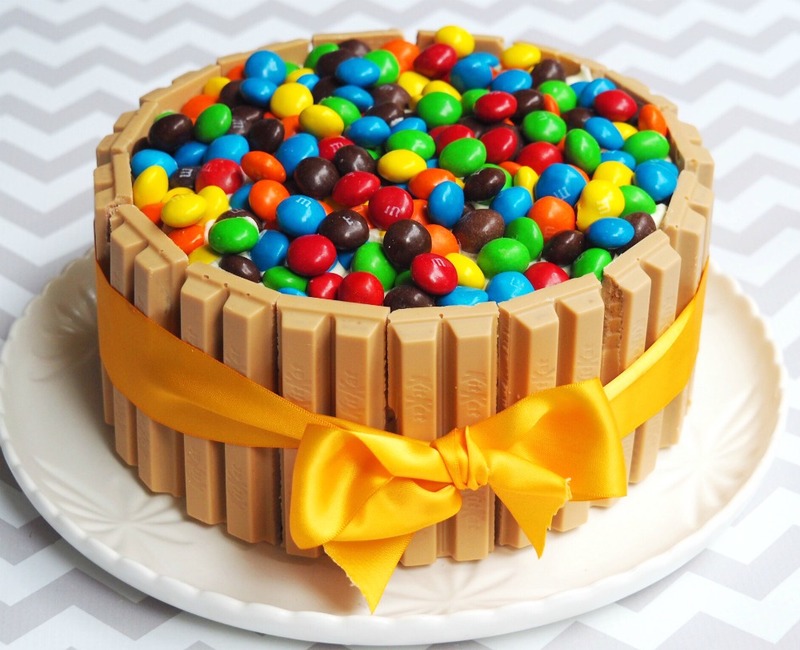 Check that the Kit Kats are a centimetre or two higher than the cake because you want to leave some space for the M&Ms! Break theKit Kats into double fingers. Just before placing the Kit Kats on the cake pop them in the freezer in a Tupperware layered with baking paper. This way you won’t get any unsightly fingerprints on your Kit Kat fingers. Place a couple of dollops of icing on the plate to secure the base of the cake. Slide some strips of baking paper under and around the outside of the cake. Sandwich the two cakes together and then slather the cake in icing. You don’t have to be too precious about this because everything will be covered in Kit Kats and candy! 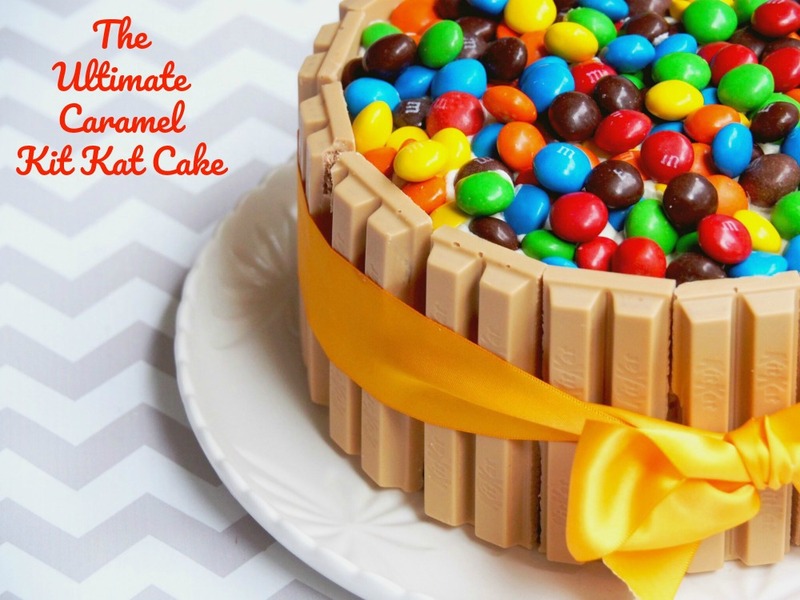 Gently remove the paper by sliding it from under the cake before decorating with Kit Kats. Gently position the Kit Kats around the cake. Make sure each bar is almost touching, that way you will be able to cut smoother slices. Tie a wide ribbon (about 4cm wide) around the cake after decorating. This will help keep theKit Kats in position and hold everything together nicely. 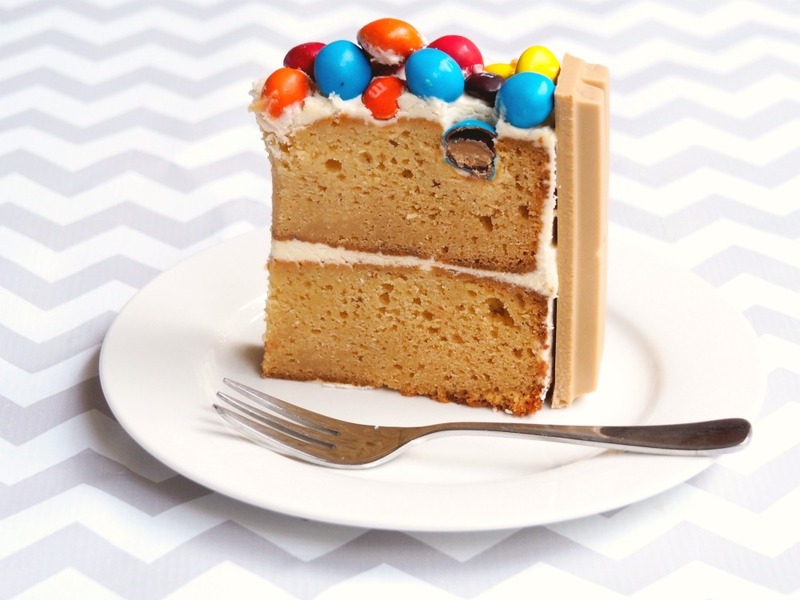 Top the cake with M&Ms and you are good to go! Place butter, chocolate, sugar, golden syrup, vanilla essence and water in TM bowl. Melt for 4 minutes at 70 degrees on speed 2. Scrape down sides of bowl and heat for a further 1 minute at 70 degrees on speed 2. Allow to cool for at least 10 minutes. Add the top ‘n’ fill and sour cream and mix for 5 seconds on speed 4. With the blades running on speed 3, add the eggs one at a time through the hole in the lid beating well after each addition. This should take about 30 seconds. Add flours and mix on reverse speed 3 for 20 seconds. Scrape down sides of bowl and mix for a further 10 seconds on reverse speed 3. Place batter into prepared tins and cook for 35-40 minutes or until a cake tester inserted into the centre comes out almost clean. Continue to check in 10 minute intervals until cake is cooked through. Be careful not to overbake the cake – the skewer should not come out perfectly clean because you want the mud cake to be a little bit soft and sticky.